Glorious sleep. Sleep that would probably go down in the history of my life as the best sleep I have ever had. I must have slept for about 2 ½ hours, solidly and deeply. As my body began to wake I opened my eyes slowly, a smile already breaking on my face as the realisation of everything that had happened in the last 24 hours filled my every sense. 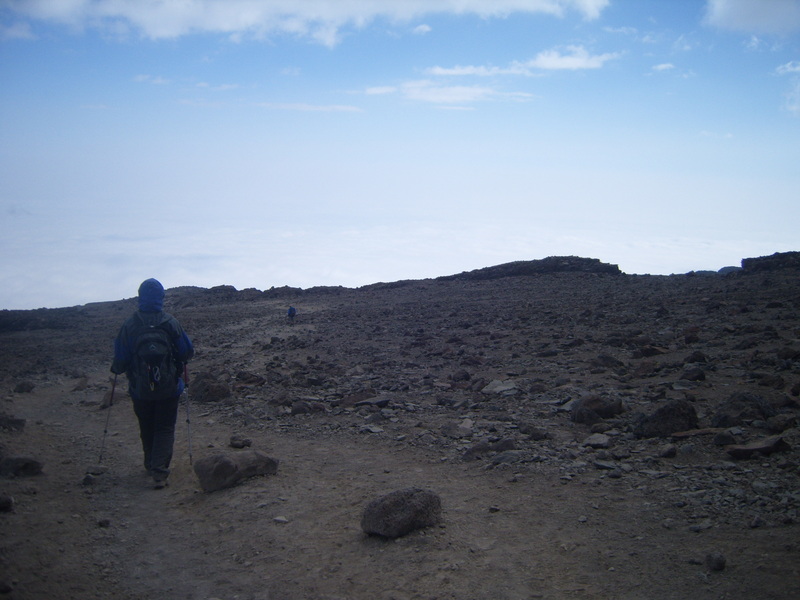 I had just summited Kilimanjaro! I lay there smiling in the stillness of base camp with the background noise of the porters chatting and laughing. The agony of last night and the ecstasy of summiting this morning played through my mind, my smile growing ever bigger as the thoughts played through the film of my mind. Breathing deeply as I remembered, I quietly celebrated my achievement. Next to me Donna was beginning to wake too. What an incredible journey we had just achieved! It felt almost surreal, I knew I had reached the summit and my body had all the tell-tale signs and the exhaustion was still overwhelming. I had to pinch myself to make sure I was really awake. As I looked over at Donna, her smile told me it was all true. Sitting up, waves of “Oh My God I’ve Just Summited Kilimanjaro” hit me again and again as waves of surreal realisation crashed over me. I had achieved what I had set out to do. I thought of Emma and smiled even more. I knew she would be proud and I longed to pick up the phone and shout it out to her. But we all know I couldn’t do that and it was okay because I knew she was with me in spirit and I knew she got to see it all first-hand anyway. 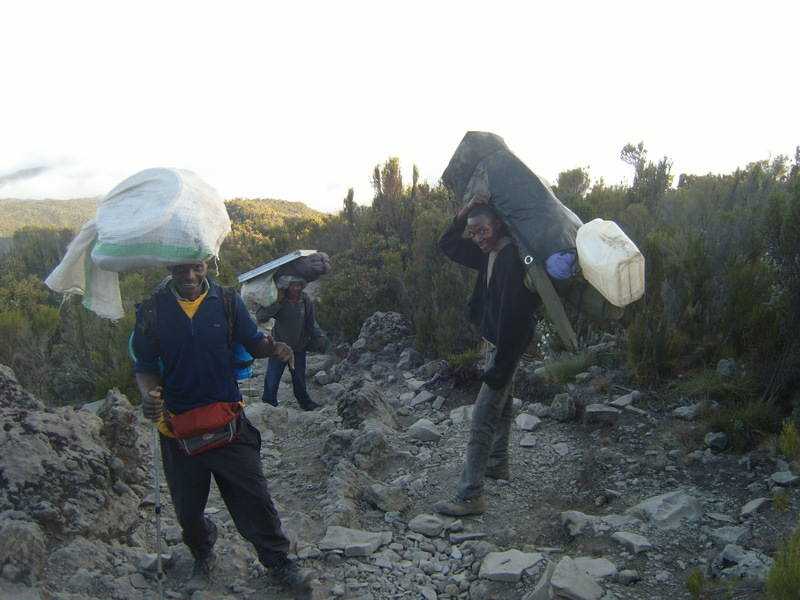 Before we headed out for some lunch we packed our bags again ready for our descent to Mweka camp, which sits at 3100m above sea level. This is where we would spend our last night on the mountain. As I began to pack, upon closer inspection of my summit night pants, I found them coated in thick layers of Kilimanjaro dust. My pants were no longer black but a lighter shade of grey and from the knees down my summit night pants now sported slashes in the material, like someone had taken a knife and slashed it numerous times across my legs. 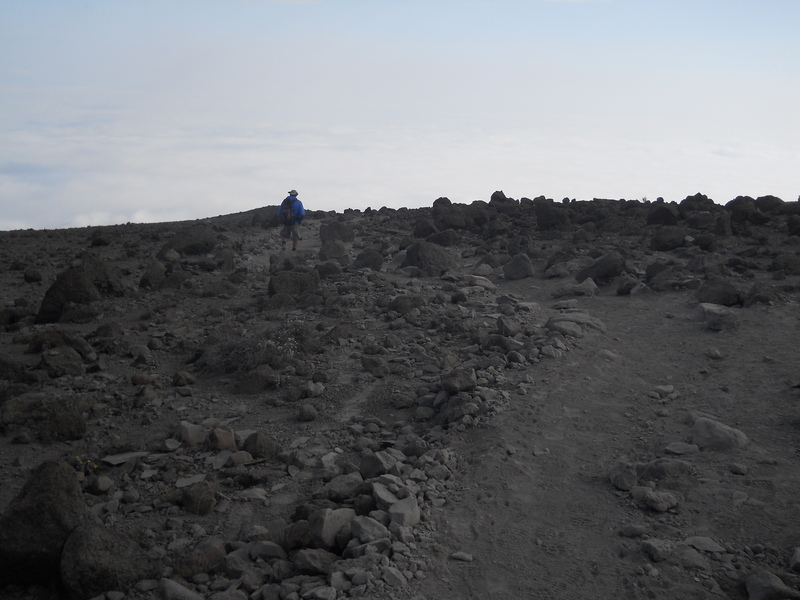 Highlights from my night before, sleeping walking while climbing Kilimanjaro, bashing into rocks and shredding my clothes came flooding back to me! I had been there. I had done it! And I got the pants to prove it! Damn, it felt so good! My bags were packed and ready for my journey down to the next camp but first I had an important phone call to make home. I stepped out in the glorious sunshine that enveloped Base Camp. No hikers were around, most either sleeping or already making their way back down the mountain. The porters sat around chatting and laughing on what was, for them, just another day on the mountain. The sun was gloriously warm although the wind was chilly. I stepped carefully over guy ropes of the tents packed closely together and found a perfect rock to perch myself on in the sun as I dialled the number for home. Words so many people back home and around the world were watching and waiting to hear from me. My mom told me how she had been waiting all day for this call. She sounded so happy. I knew she was proud of me. I laughed as she told me that she took her cellphone to gym that morning and kept it right next to her matt on the floor so she could see it if it rang. Everyone knew she was waiting for a call from the top of Kilimanjaro. I wish more than anything I had called from the summit or even before I had slept but at those levels of exhaustion it’s even hard just to speak! It was good to phone home and share my news and it filled me with the pure joy again of my summit success just hours before. After a short while we said our goodbyes and ended the call. I sat there on the rock in the sun longing to message my best friend whom I knew was also waiting for news from me. Donna hadn’t contact her mom yet so I had to wait a little longer otherwise the news would spread and Donna’s family would find out before she had gotten the chance to phone them and tell them herself. I hoped my friend back home would understand. I went back to the tent and waited for Donna as she finished with her packing then we headed to the mess tent for some lunch, which had been prepared for us. We found Thomas sitting in the tent after he too had had a short sleep. He said that Simon and Anthony had just returned a short while ago and were sleeping now. It was good to hear they were down and now getting some much-needed sleep. I poured a nice hot cup of tea, the taste exploding in my mouth. My appetite was still pretty non-existent but knowing I had to be good to my body after she had carried me so amazingly up to the summit, I nibbled on what I could to replenish some of that energy I had consumed throughout the night. We chatted about our summit success and shared stories. Judi woke and came and joined us too. She had heard our voices and decided even though she wanted more sleep she would depart with us as she didn’t want to walk in the dark. It would still take us at least another 4 hours to get to the next camp and as it was around 1pm already, we knew we had to leave soon to make it before dark. With our bodies replenished and with a bit of rest behind us, we picked up our backpacks and headed out. Our guide Moses would make the journey back down with us and Dickson and Milton would stay behind and wait for Simon and Anthony to wake so they could lead them back down to the next camp. Inevitably, they would end up walking in the dark again. 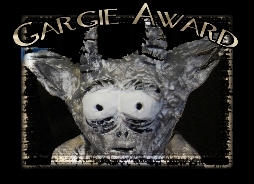 My exhausted body longed for more sleep but we all knew it was best to push on again. The air was cold as the wind blew and the landscape was baron and covered in dust. At times we walked together, chatting a little and at times we separated merely by one walking faster or slower than the others, each walking with their own thoughts, no doubt, like me, reminiscing about the night before and our summit earlier. Sounds of “Jambo” “Jambo” echoed out of the stillness as porters flew past us as they made their way down to the camp that awaited our arrival below. Their energy and heavy loads they carried still astounding me. Thomas making his way “down” to Mweka Camp, Yup, even though we were heading down, we still climbed hills! None of us took many photo’s on our way to Mweka camp, probably complete exhaustion preventing us from making the effort to take out our cameras. Donna and I, despite the exhaustion, still had time to mess around with our trekking poles to create a part of the “three” peaks! 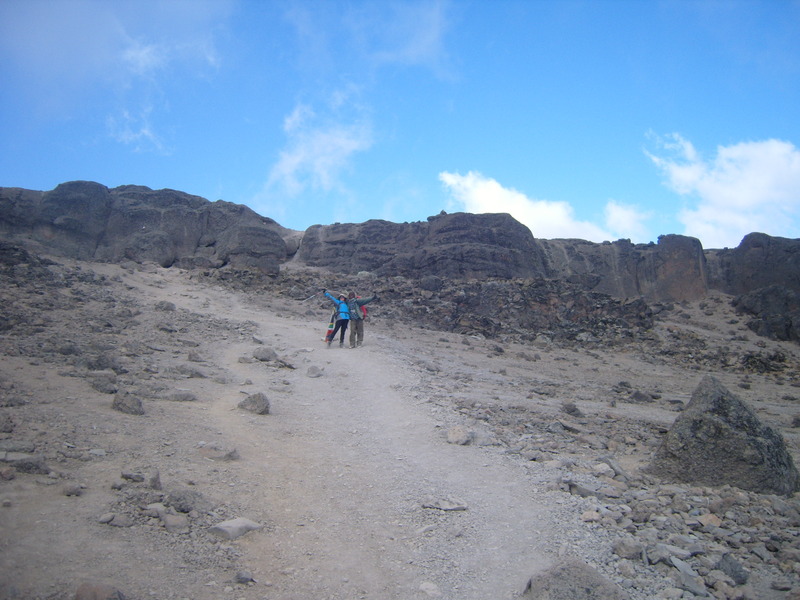 The first part of the walk was smooth ground with lots of dust but as we got lower the path became smaller and we had to navigate around rocks and down steep steps. The knees were weak and the legs felt even weaker as we made our way down, carefully navigating the rocky path and loose sand on the steep slopes down. At some point while walking I hear my phone beep to life. When I could I stopped to pull it out, knowing it’s probably Natalie, my best friend wondering why I haven’t messaged her yet. It was her and this is what she had to say. Donna still hadn’t managed to make contact yet, so I didn’t want to reply. It was killing me not to send her a message but I knew she would understand! Eventually, after what seems like hours of walking we came across some benches on our left and a hut where some officials of some sort were in. To our right was another camp but that was for those still making their way up the mountain. We stopped and rested here for a while as we waited for everyone to catch up. The sun was warm as we sat on the wooden benches chatting. I longed to take off my shoes but with more distance to cover to our camp site, this would not be a good idea. Once everyone was together again and rested for a bit, we continued making our way down. 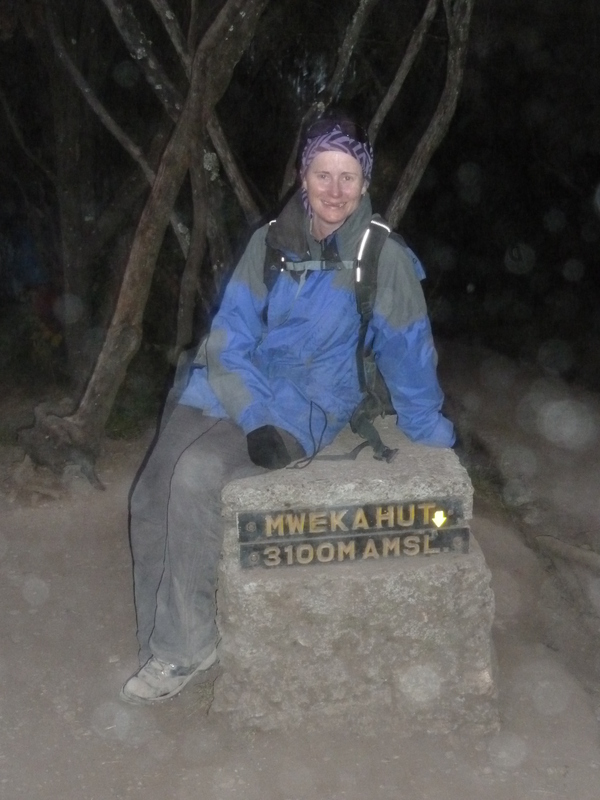 After 4 long hours of a monotonous descent through the rocky and arid landscape, Judi and I who were walking together, walked into the rain forest and into Mweka camp. It was misty and cool and was just beginning to get dark. 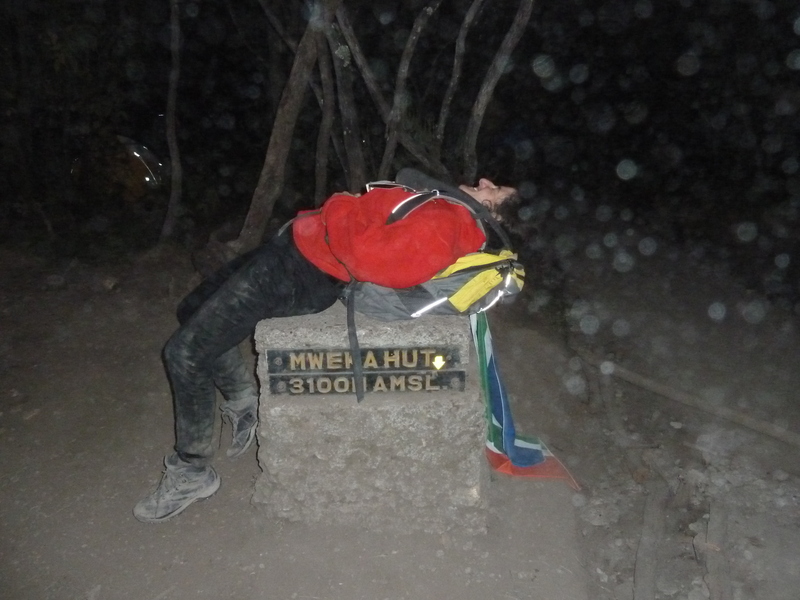 Grateful to be in camp, we stopped at the post announcing our arrival in camp and attempted to take some pics but the mist was not allowing for perfect pictures, but A for effort after summiting Africa’s highest mountain! Just as it was getting dark, we finally arrived! Exhausted but happy to finally arrive in camp, Judi could no longer hold herself up! Note the dust she’s covered in. None of us were clean anymore! Finding our camp to the welcome of all our porters, who had already set up camp for us and dinner was already well on its way to being prepared, we chose our tents for the night and happily offloaded our backpacks! The atmosphere at the campsite was quite different from that of the previous nights at camp. The porters were singing and dancing and the relief of knowing we had summited showed on everyone’s faces. The atmosphere, although filled was exhaustion, was fueled by the lightness everyone was feeling and there was celebration in the air. After settling in, with a fine mist drizzling down on me, I grabbed my headlamp and headed out to find some signal on my phone to finally send a message to my best friend telling her my good news. 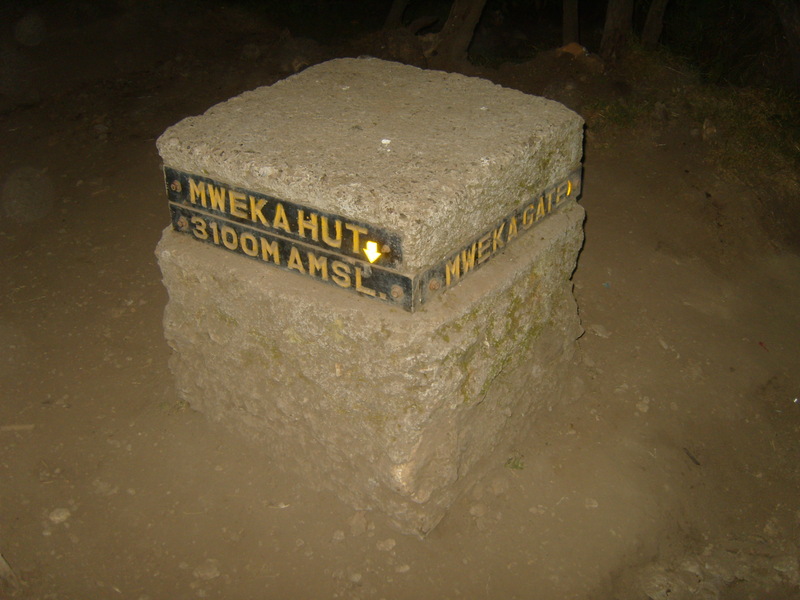 Eventually, in the dark I found one single bar showing me I had signal so I climbed onto the pillar that told us we had arrived in Mweka camp and dialed her number. It didn’t connect. I tried again. But no luck. I start typing a message telling her the news she has been waiting for. I pushed send, but the message seemed to hang and then didn’t go through. Disappointed, I eventually gave up. I felt sad I can’t share my news with her as I knew she had been waiting all day for it. Back in camp, when I eventually found it after walking up and down the path for a while in the dark, I climbed into the mess tent and settled down with Donna, Judi and Thomas as we waited for dinner. We wondered how Simon and Anthony were doing walking down in the dark. I hoped they weren’t too far away. I was feeling exhausted and could only imagine how tough it must be walking in the dark again, especially after last night. I hoped at least they had managed to have a decent sleep and that it would fuel them forward. In hindsight, the couple of hours rest we got at Base Camp after our summit was of enormous value. 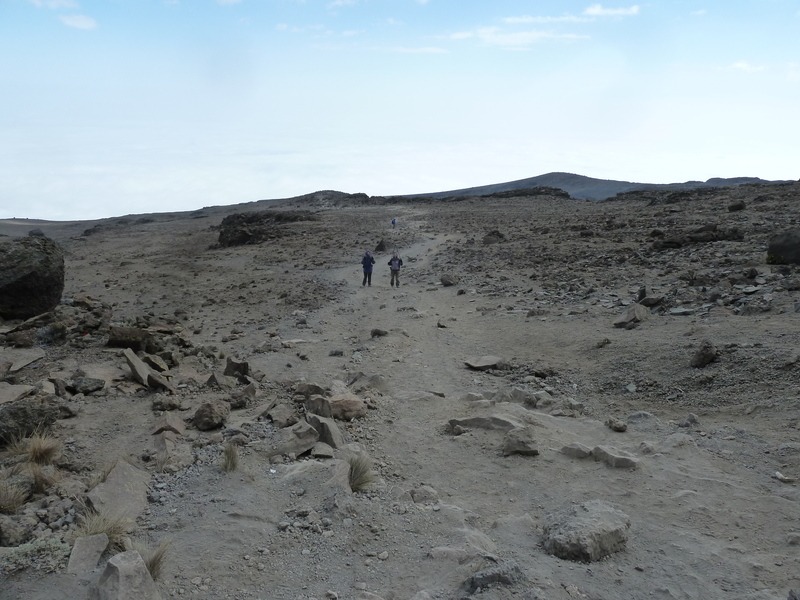 Although it didn’t seem like much at the time, it somehow brought a little bit of life back into our exhausted bodies and tired legs and gave us just enough energy to make the long, long descent to Mweka Camp. Just before dinner was served, we got news that Simon and Anthony had arrived in camp and would join us shortly. Although my appetite was still pretty much non-existent, I knew my body craved some nourishment and I ate as much as I could, which wasn’t really much at all! The team all together again, that night, we celebrated quietly with some wine with our dinner. Although completely exhausted, the chatter was one of excitement and achievement, we had done it! It was an early night for all of us, our bodies craving sleep after having pushed ourselves to limits beyond anything you could ever imagine. 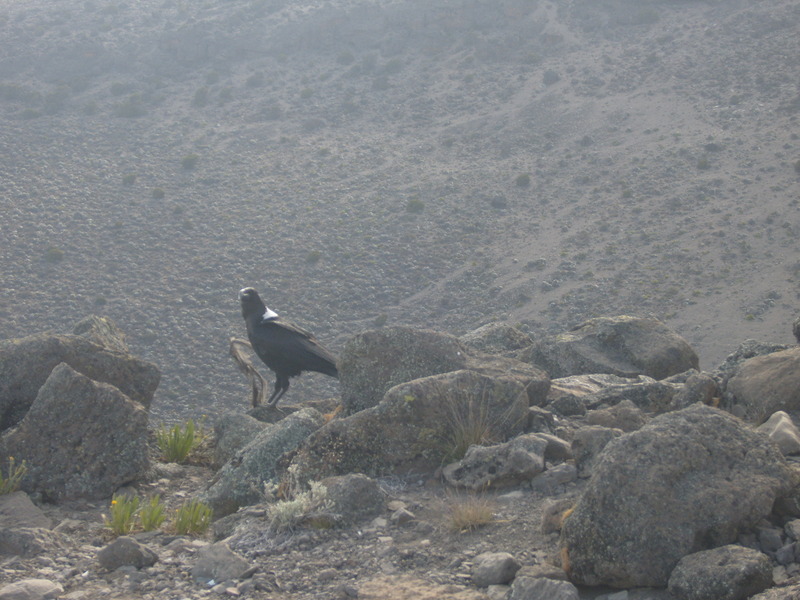 As I lay down and sleep began to wash over me, thoughts of Emma and I standing on the roof top of Africa washed over me. And yet physically…. I smiled. Standing on the summit, I looked out and realised at times the night before I didn’t know I had it in me. But that’s how you get stronger. That’s how you beat the next hill faster. Yes, there are seasons when we need to stop and rest or tend to an injury. But there are other moments when the only way through is to just keep going. We had all done that last night. I can see it coming ~ a hill in the distance. It calls my name, dares me to climb it. I move upwards and feel the effort. Legs beg to stop. Lungs scream for air. Shoulders ask for a break. Mouth reminds me I’m thirsty. These are the breathless moments where dreams come alive. WOW my friend!! What an awesomely story and achievement. Well done over and over and over again!!!!! *Mission Accomplished* for sure! :) Looking forward to tomorrow night, gonna be a super special celebration!